When it comes to getting the most from the web, SEO agencies have been watching the increasing rise of mobile platforms for a number of years. Yet some of the more recent developments, such as Penguin 4.0 and the move to a separate, more sophisticated mobile index, have made this message more clearer than ever. If you’re not optimising for mobile users, you’re going to miss out. So, how can you do this? 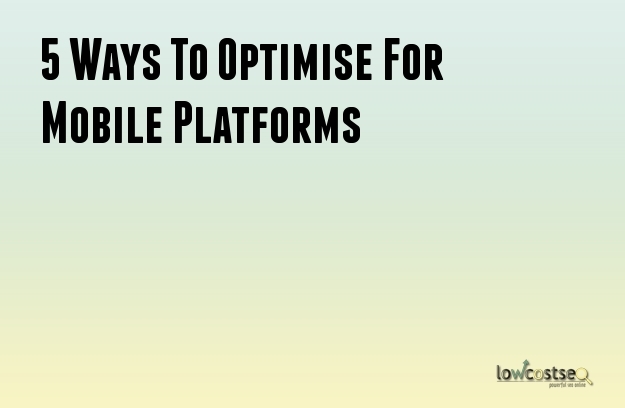 Let’s look at 5 efficient ways to address the concerns of mobile platforms. This is assuming, of course, that you already have the basics – such as a separate, dynamic web layout for mobile devices with responsive design – already figured out. It’s still unclear at this stage what factors are important, but it’s clear that the mobile index is looking for fresh and relevant content. After all, people on mobile devices want the latest information, so how can you ensure your content is relevant? There are many ways to do this, such as ensuring your news, blogs and other relevant content are frequently released and suited for mobile platforms. There are some situations, such as with infographics, where the small screens aren’t preferable, so some experimentation is to be expected. Similarly, a separate index means that different keywords become a priority. There are many examples where one can argue a mobile user has different needs than a desktop browser. For instance, the former may search online stores directly for what they need, while someone at their computer can take their time to browse, compare and read up on products. Clearly, how this information is given to the user will make a big difference. Consequently, this also means the keywords involved will vary. With the right tools, you can find the mobile ratio of all your keywords – that is, the amount of users coming in from such devices. Find these search queries and make them a priority. Ensure this content gets pushed more and stays mobile-relevant. On a very similar note, it might be worth pushing your local search options, especially if you have physical locations or premises. Again, this ties into a mobile users needs. Someone on the go might just want to be able to find something in their town, so you should ensure your business ranks highly on a local factor. Aside from Google Maps listings, ensuring your address and phone number are clearly displayed, alongside clearly mentioning your location in general, will be greatly appreciated. Depending on how your website it set up, you may have mobile specific pages to compliment the traditional website. In these instances, you want to ensure all of your redirects are in working order. When Google crawls sites, it should be aware what is a desktop and what is a mobile site, so that it can direct users accordingly. Finally, while you can go to great lengths on keyword analysis and producing great content, the website itself still needs to do the part. A well designed website might look nice, but too many elements can often get in the way. It’s well known that users prefer a quick loading time, so don’t make the site too busy. Similarly, flash elements should be avoided, as they don’t work on all devices. You can still make a website visually appealing, but ensure that it is simple and straight to the point. This ties in with choosing the right keywords, as mentioned previously, since mobile users are often looking for a very specific answer.